Crimping connectors with the Stanley Hydraulic Tools CT Series crimpers is quick and easy. They are 5-10 times faster than hand-pumped tools and more than twice as fast as high pressure double acting crimpers. The CT Crimpers require no booster or intensifier which means they can be operated directly from the hydraulic circuits already installed on line trucks, dedicated power units, or from one of the STANLEY portable Power Units. Swivel Design on all models provides 360° continuous rotation of the die head for easy alignment to give higher quality crimps. 1650 Models allow the use of the CT on almost any hydraulic system of at least 1,650 psi (114 bar). An accurate, built in relief valve ensures that at these system pressures and higher, a full die load is achieved preventing over-crimping. 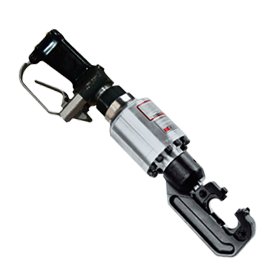 CT04 STANLEY® SE4 is a small and lightweight tool ideal for service entrance termination and underground crimping. It accepts 90% of available service entrance connectors and accommodates wires up to 4/0 in (13 mm) diameter. Compatible with most commonly available crimping dies from all major manufacturers, including “W” style dies and “X” style dies. The CT06 is a 4-point dieless crimping tool with a capacity of up to 750 MCM aluminum cable or 500 MCM copper cable. CT06 CT06026N Crimping Tool, OC/CC, 4-Point Dieless Head, 1650 PSI.